First, here’s the passage: ” ‘I can guarantee this truth: People will be forgiven for any sin or curse. But whoever curses [blasphemes] the Holy Spirit will never be forgiven. He is guilty of an everlasting sin.’ Jesus said this because the scribes had said that he had an evil spirit” (Mark 3:28-30 God’s Word©). 1. Curses [Blasphemes] – the Greek means “showing disrespect, denial of the true nature/character of”. 2. How can something be forgiven if there is no repentance, or submission to Creator? 3. Anyone who worries they have committed the unforgivable sin HASN’T! Those who commit it don’t care. 4. It is not a single act; it is a persistent choice. You stop on the street to pick up someone in your car when you see their car has broken down. They deny your car is yours, don’t trust your driving, claim you are going the wrong direction, and declare that they didn’t ask for help anyway. They mock you for offering help when they have everything under control; it’s just they can’t get anywhere. They won’t get into the car so you cannot give them a lift. You drive by every hour for a week, and they reject your help every time with increasingly bitter ridicule. I hasten to add that it is not our place to decide if someone lives in this sin. Often, as Paraclete works in the soul of a wayward sheep, the lamb becomes more and more belligerent. A person’s contempt may be the symptom of a soul coming around to Jesus. “The Lord isn’t slow to do what he promised, as some people think. Rather, he is patient for your sake. He doesn’t want to destroy anyone but wants all people to have an opportunity to turn to him and change the way they think and act” (2 Peter 3:9 God’s Word©). “What do you think? 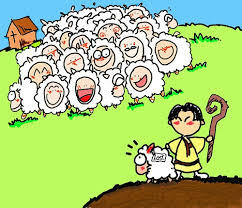 Suppose a man has 100 sheep and one of them strays. 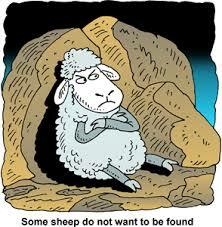 Won’t he leave the 99 sheep in the hills to look for the one that has strayed? I can guarantee this truth: If he finds it, he is happier about it than about the 99 that have not strayed. In the same way, your Father in heaven does not want one of these little ones to be lost” (Matthew 18:12-14 God’s Word©). I’m pleased that it has been a blessing. what a good message, thanks! I agree with you. That’s why I have a certain peace when anyone worries about it. Thank you. And thanks for catching the typo. Thank you, my friend. I think this issue is important, and since I was asked about it, now was the time.